Entrée to Black Paris has created a new Josephine Baker walking tour called "Josephine's Suburban Paradise." It unfolds in the Paris suburb of Le Vésinet, where Josephine lived during the height of her long and illustrious career. With a population of 17,000, Le Vésinet lies a mere 20 minutes to the west of Paris on the RER A railway line. Charming, quiet, and dotted with lakes and parks, the architecture of this town’s private homes is remarkable. 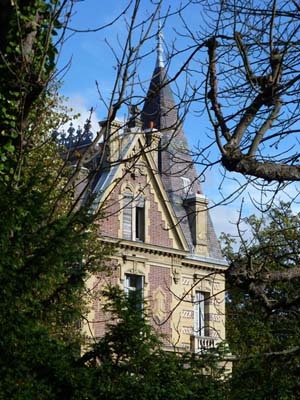 One of its prizes is Le Beau Chêne, the mansion that Josephine owned and called home for eighteen years. The visit begins with a private lunch at Villa La Riante, a 19th century mansion that has been transformed into a beautiful bed and breakfast by Americans Jim and Kristie Worrel. Kristie is the chef and she lays a magnificent table! Over dessert, our guide will present an overview of Josephine's life in Le Vésinet. A leisurely stroll through the idyllic town takes place after lunch. The highlight of the walk is the visit to Le Beau Chêne. The property is private, so we are limited to a view of the mansion from the gate and a stroll around the perimeter of the 3.7-acre grounds. We provide detailed descriptions of the interior as well as anecdotes about events that took place in the mansion. Other points on the walking tour include a plaque featuring a photo of Josephine at the opening of the Tour de France in 1933. Nearby, at the town hall, participants will learn about Josephine's efforts to re-establish residency in Le Vésinet when she was facing eviction from Les Milandes, her chateau in the Dordogne. The luncheon and walk are designed for groups of 10-15 persons. For more information, contact us at paris[at]entreetoblackparis[dot]com.